2 boat Steve. – Dirty wet dog , boats and sailing. A few weeks ago when i last went down to Calstock boatyard to pick WABI”’ off her mooring i bumped into Chris the boss who of course asked me about my new boat . Chris had been expecting that i would be buying a slightly larger boat, maybe as a project boat, and selling the Liberty. I think i made some excuse about buying a smaller boat to reduce costs and of course Chris retorted that it only works if you have 1 small boat and not 2 !. He is right of course although i did remind him that he is also ‘2-boat’ Chris and both of his are bigger than mine….his small one is bigger (just) than the Liberty although it was looking a bit sad last time i saw it. Veracity is Chris’s second boat, also a lugger, and as can be seen has a rotten transom : Chris was muttering ‘eopxy’ last time i saw him. His ‘other’ boat of course is the big lugger ‘Spirit Of Mystery’ which i still want to cover here sometime : every time i try either Chris is manically busy with something else or i am. I didn’t plan to be a 2 boat owner…honest. Had i bought a larger project boat my plan was definitely to have sold the Liberty after a quick ‘tart’ and put the money into a bigger boat. We did go and see bigger boats from larger trailer-sailers right up to the potential ‘big’ offshore boat (GK29) but the only boat that both Jax and me liked was a smaller and very scruffy Sadler 25 which needed a total refit and not just a bit of tidying. The eventual decision there by the way which didn’t happen but came very close was that the ideal one for my sailing would have been the bilge keeled version which would have been the first bilge keeler (and probably last) that i owned. That decision came about after eventual contact with somebody in the Sadler brokerage world who recommended not using beaching legs on either of the fin keeled version which i had thought of at first. I did then think that when i bought the dayboat the same plan might apply except that the Devon Dayboat wouldn’t need anything like the same budget to get really nice but that the total budget would also need to include a new towing vehicle at some time . I have had the Pajero for 10 years now and it is at least 20 years old so its going to need replacement in the next few years and really with something with enough grunt to pull the DY over long distance. The recent trip though made me realise how much we both enjoy the Liberty and how good a small boat it is for the kind of thing i am doing with it right now . The last part of our recent trip had us coming in over a very thin tidal bar after a bouncy coastal passage and then drying out quite happily in a mud berth and there aren’t that many boats in its size and budget range that will do the same thing. So i am still very enthusiastic about the Liberty and do plan to continue the WABI”’ voyage at least into the next section which is Lyme bay , Poole and the Solent/Chichester next year. After that i’m not sure , the liberty would be a very good boat to explore some of the east coast with but mooring the boat somewhere over there plus the driving costs could be a problem. At some time the budget for running a boat at a great distance from home would make it more viable to take a boat there and back rather than have a moored boat which doesn’t get visited often so that is when the Dayboat comes into play. Its time to do some detailed planning here. I am going to try and sail WABI”’ in and around the Exe this autumn and into the early winter if conditions allow while doing the essential upkeep jobs while in commission. At some time i might have her lifted and power-washed especially if the yard here would do and lift-scrub, let me antifoul, and lift back in. 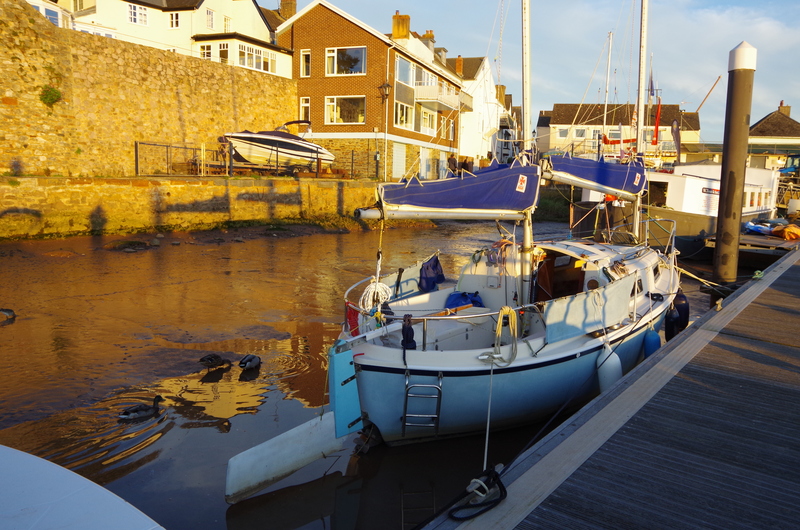 In the spring if i am ready i will do the difficult Lyme bay section although if conditions allow it would be fun to try and get into one of the small harbours : Bridport for example. Poole would be a good base for a while although it can be shockingly expensive to keep a boat there. The Dayboat project isn’t exactly on hold either though as there are lots of days when i’m not at work and won’t be over at Topsham so those days are ideal for working on the project now that i have cleared most of the garden work for now. The driveway is finished and i still have to cover and render the back garden retaining wall but that needs a few dry days and that doesn’t seem to be a happening thing right now. There is some heavy work going on here but that’s not new. I have started work on the Dayboat and have both of 2 refit plans(rig and set-up options) pretty much in place and the next part of that is to draw the rig properly and talk that over with a sailmaker to check the balance etc. Soon i will start to get the materials that i need to do the jobs that don’t cost much but need a bit of time and thinking and i have already found useful bits and pieces from my project box. I just found a good bilge pump and some Barton hatches for example. I do have some leave early in the new year and with materials in place i could get quite a lot of the jobs done then with an actual plan of her first trip out being in early summer next year….possibly La France which would be neat. For those of you that followed my fitness project i have had a couple of weeks off with the trip and then one slack week at work when i only did a hundred press-ups a couple of times !. Today that side of things is getting a re-boot as i need to find the next ‘100’ challenge . The 100 heavy carry’s are finished, i have done 100 press-ups in a day several times now in fact taken that up to 160 one day so i am looking for a new one to go at. Though trying not to get numbers fixated it might be worth trying to push my deadlift back up to 100kg and maybe doing one thing i really dislike but has some value ie running….good target might be 100 run/sprints as i can several per workout. Anyway i am also working on those plans. The fitness project re-boot gets a separate thread by the way.